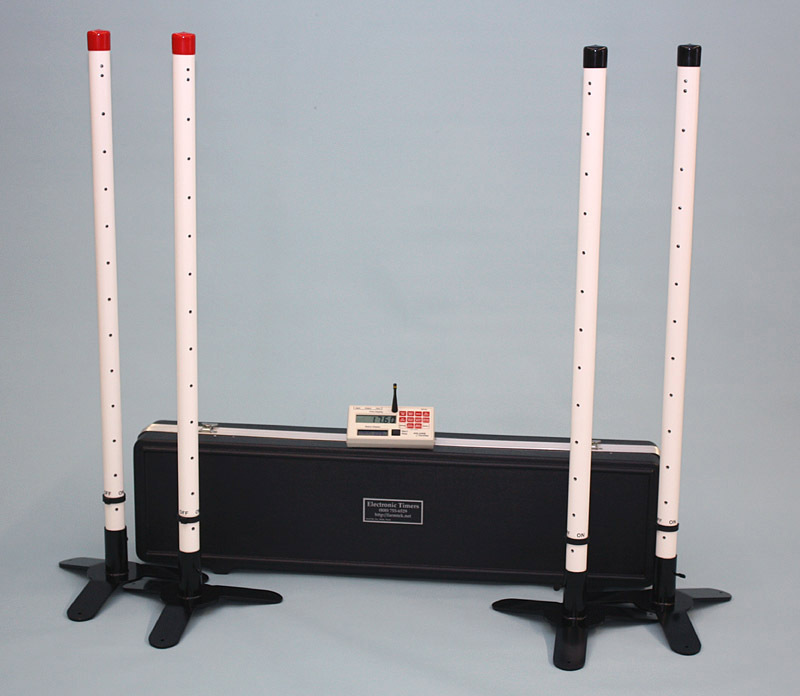 If you have recently attended a dog agility trial, chances are one of our timing systems was in use. At the heart of the agility timing system is our Polaris timer console, specifically customized for the requirements of dog agility trials. 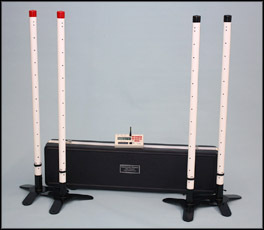 Our dog agility timing systems use multi-beam light curtains instead of the single-beam electric eye used for other applications. The light curtains are necessary to ensure reliable and accurate timing of dogs. Support for AKC, CKC, USDAA, NADAC, ASCA and AAC venues. The timer provides features to support Standard, JWW, and FAST classes as well as gaming classes like Gamblers and Snooker. Convenience of wireless operation – no connections between the timer and the light curtains. Even the scoreboard and amplified speaker can be controlled wirelessly (when purchased with their respective wireless option). The light curtain photo-sensors ensure the leading part of the dog is reliabily and accurately detected – even with variations in dog jumping and running styles. The optional amplified speaker allows sounding of tones for games, for speaking "go" when the course is ready, and for speaking the table count with an accurate cadence. The optional wireless handswitch can be used to control the table count in conjunction with the amplified speaker. The handswitch can also be used to manually start or stop the timer if needed. 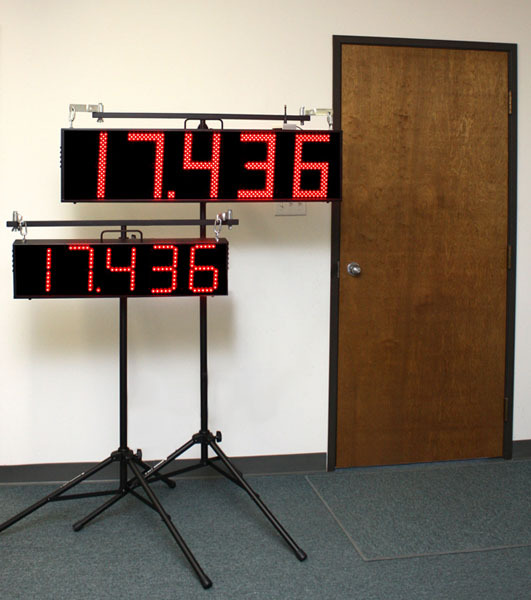 Large spectator displays (scoreboards) are available to show the contestant's running and final time. The timer can provide a walk-through count down and show the count down on the optional spectator display. At expiration of the count down, a tone is sounded over the optional amplified speaker. Includes the Polaris timing console, two pairs of full height light curtains, four pole bases with retainer (retainer not pictured), and custom hard-shell carrying case. Includes the 7 inch LED scoreboard, carrying case, scoreboard stand and 50 feet of cable to connect the Polaris console to the scoreboard. Includes the 10 inch LED scoreboard, carrying case, scoreboard stand and 100 feet of cable to connect the Polaris console to the scoreboard. With the wireless scoreboard interface, you do not have to run the data cable from the Polaris console to the scoreboard. The scoreboard still requires AC power. The amplified speaker allows sounding of tones for games, for speaking "go" when the course is ready, and for speaking the table count with an accurate cadence (requires wireless handswitch, below). Includes the amplified speaker, a cable to connect the Polaris console to the speaker and a padded carrying bag. Same as the wired version above, but the speaker does not have to be connected to the Polaris timer in order to operate (AC power still required). The wireless version also adds additional voices and phrases so that adjacent rings can have different sounds. The wireless handswitch is used to control the "table timer" countdown through the amplified speaker. The handswitch can also be use to manually start or stop the timer. The computer interface cable provides a connection between the Polaris timer console and a serial or USB port on a computer for record keeping. Includes a free 30-day trial of our Timer Interface Software. *See our helpful hints page for light curtain power/battery issues here.